1The conference on ‘The Nigerian Democratization Process and the European Union’ was organized to encourage broad participation and debate. The issues discussed are summarized here under six headings: previous programmes for transition to civilian rule in Nigeria; issues of political culture and society; the current transition exercise; the promotion of democracy in Nigeria; related economic issues; and the role of the European Union (EU). 2Since 1966, successive military governments have controlled the country for all but four years (1979-83), making it possible to compare the current administration under Major General Sani Abacha with previous regimes. Such a comparison is particularly pertinent in terms of transition mechanisms used by the Olusegun Obasanjo (1976-79) and Ibrahim Babangida (1985-93) governments to recivilianize the political machinery because of similarities with those of the Abacha transition.1 These similar mechanisms are sequenced as follows: (a) development of new administrative structures (states and local governments); (b) discussions on amending the constitutional framework; (c) lifting the ban on political activity; (d) local government elections on a nationwide scale. 3Only the Obasanjo government, which took over the transition process in 1976 from assassinated leader Murtala Muhammed, succeeded in handing over government to civilians, though the Second Republic only survived from October 1979 until December 1983, when the military again intervened under the leadership of General Muhammadu Buhari. 4Babangida, who seized power from Buhari in a bloodless palace coup in August 1985, developed a programme of transition initially with a deadline of 1990. In January 1986, a 17-member political bureau was constituted to consider in a wide-ranging manner the political issues and future of the country. The ‘Politburo’ submitted its report in March 1987, but the military developed its own agenda, and in July, Babangida laid out a five-year transition programme, delaying the handover to civilians until 1992. The transition process was never democratic: Babangida controlled it by means of 57 military decrees, excessive interference and numerous excuses to stall it. Babangida’s manipulation contributed to a popular perception that he possessed a ‘hidden agenda’ to maintain power. This increased in 1989, when he banned all existing political associations and forced those aspiring politicians allowed to participate into two ‘manufactured’ political parties, the National Republican Convention (NRC) and the Social Democratic Party (SDP). Elections at local and state levels took place relatively peacefully in December 1991, but continued interference hampered the successful completion of the presidential elections. 5Early in 1993, Babangida intervened to bar the presidential candidates legitimately selected by their respective parties. He dissolved the party structures, and appointed caretakers to come up with different and more acceptable candidates. Many NRC and SDP members were outraged by this blatant intervention, but had little option but to bow to Babangida’s demands. The presidential elections finally took place on 12 June 1993 and the SDP candidate, Moshood K.O. Abiola, a Muslim Yoruba and wealthy businessman, emerged victorious, breaking the seemingly insular mould of traditional Nigerian politics by appealing to voters across the ethnic and regional spectrum. Ten days later, however, Babangida annulled the election results claiming, against the opinion of most observers, that irregularities had undermined the process. 6Babangida was eventually forced to ‘step aside’ from office in August by a combination of forces – the press, pro-democracy groups and senior military officers – and an interim national government (ING), chaired by the civilian, Ernest Shonekan, was appointed to prepare for fresh presidential elections in February 1994. This pretence was swept aside on 17 November 1993 when Sani Abacha, Defence Minister and Vice-chairman of the ING, proclaimed full military rule. Pro-democracy groups and the SDP had threatened to boycott the 1994 elections, but Abacha’s initial inclusion of notable democracy activists in his administration pacified many groups in the short term. However, plans for a transfer of power to civilians were soon cancelled and a climate of repression emerged in which the Abacha regime sought to silence any opposition. It was within this context that Abacha grudgingly announced, in October 1995, a new transition programme to return power to civilians by October 1998. 7By 1998, Nigeria will have been in ‘transition’ for thirteen years. Transition programmes have been increasingly perceived as a way to legitimize and extend military rule, and so the extension of this current transition beyond 1998 would take few observers by surprise. 8Numerous societal issues that impinge on political culture and the democratization process were discussed during the conference. Many of these issues were considered to be long term, both in cause (back even to the pre-independence era) and solution. Furthermore, different groups within the society perceive ‘democracy’ in different ways, tending to bring some confusion into the dialogue about transition. Tensions arising from ethnic and religious divisions or differences constitute some of the most critical impediments to a successful transition. In other words ethnic and religious affiliations contribute to the mutual animosity and suspicion between North and South; but neither region is monolithic because ethnic and class differences within them contribute to further division. There are an estimated 250 ethnic groups in the country, with the three largest groups – Hausa-Fulani, Igbo and Yoruba – usually considered dominant. Tension exists not only between the three major ethnic groups, but also among smaller groups identified as ‘minorities’. Abiola apparently made significant inroads into the North, winning even the ‘radical’ state of Kano, and so illuminating a more complex political-scenario beyond ethnicity. 9The broad religious divide between Christian and Muslim, so often tolerated in the past, has become radicalized and embittered as tensions have been manipulated for political gain. The ongoing debate on Sharia law is only one example of this schism. But within each religion, numerous splinter groups and denominations have also served to provide foci for dissension and potential instability. The main established religious groups, notably, the Supreme Council for Islamic Affairs (SCIA) and the Christian Association of Nigeria (CAN), have been generally compliant with the wishes of the Abacha administration, but more radical religious groups have attempted to define a ‘democratic space’ for themselves, though they have not necessarily had an impact on the larger national quest for democracy. Different perceptions among religious groups regarding concepts of democracy, also provide another element to the divisions. How can their efforts to promote democracy be appropriately channelled and supported? 10One key area where these ethnic and religious issues intervene with the political process is in the creation of new states. The Nigerian federation had evolved from three regions at independence in October 1960 to 30 states in September 1996 (with the Abacha government adding six new states on 1 October 1996). A positive element in the creation of new states includes the greater representation given to smaller ethnic groups and interests, thus facilitating ‘minority’ opinions to be expressed through state and local governments. The financial costs of this multiplication of government have, however, put additional strain on an already burdened national economy without contributing much to localized democracy. This is because of continuing military rule and, more significantly perhaps, because local elites that aspire to control state governments usually appear motivated more by the selfish desire to gain access to the national cake than by any altruistic feelings concerning participatory democracy. 11Ironically, the creation of new states, though couched in the language of ‘home grown’ or ‘grassroots’ democracy, actually has had the opposite effect of strengthening the power of the central government. Control over revenue collection and allocation has concentrated power at the centre as the states have become smaller and more factionalized, unable to challenge the central government in any effective manner. This trend was apparent during the Second Republic and has been consolidated by the command structure of successive military governments. This is likely to be a critical challenge to any future civilian administration. And yet the clamour by minorities, and more particularly the elites who represent them for greater devolution makes it likely that more states will be created. Although the National Constitutional Conference (NCC) in 1994-1995 refused to endorse the recommendation, its committee on new states approved the creation of 20 new states and 438 new local governments. 12The negative elements of ethnicity, religion, military government, repression, corruption and the thwarting of democracy, among other things, have raised a more fundamental crisis in political culture, namely the continuing existence of the Nigerian federation itself. The spectre of balkanization, figuratively or literally, did not appeal to conference participants, nor did the concept of a looser confederation. The prevailing opinion strongly supported the continuation of the federation, but encouraged a truly open discussion of these societal issues and problems within the structure of a legitimate constitutional conference. By addressing these issues head-on it was thought that the federation could become stronger. 13Unfortunately, the present military administration appears unwilling to enter into dialogue on these issues, confusing national unity with uniformity. Other factors undermine the process. The rampant abuse of power by the state security service is one important factor undermining a democratic transition. Obasanjo first established the National Security Organization (NSO) in 1976 after Murtala’s assassination, but Babangida reorganized it into three separate divisions, each becoming increasingly ruthless in operation. This trend has been accentuated under Abacha and Nigerians live in fear of expressing honest opinions about the future of their country. Those who stand against the prevailing wisdom of the regime are summarily dealt with in secret trials (or even without trial) as exemplified by the severe sentences passed against prominent former military leaders, Obasanjo and General Musa YarAdua. Such an environment is not conducive to an informed debate on how to deal with the challenges facing the country. How can the present government reform itself so that opposition is perceived as a democratic right and not treason? 14The status and role of women in Nigerian society and in the transition process was another important issue discussed during the conference. Women’s important economic roles have not translated into meaningful political influence, but building democracy at the grassroots level entails a fundamental role for women. Women are being included in the transition process, but in conflicting ways. Groups such as Women in Nigeria (WIN) and the Federation of Muslim Women Association of Nigeria (FOMWAN) seek to mobilize women to become active in the democratic process; other groups, such as those led by the wives of military heads of state (for example, Mrs. Babangida’s ‘Better Life for Rural Women Programme’ and Mrs. Abacha’s ‘Family Support Programme’), tend to encourage a more passive and accommodating stance. Women, like men, are also affected by prevailing societal tensions of ethnicity, religion and recession, and it is unclear what role will be played by women in the coming months. 15Another Important issue concerns the role of the press.2 The government uses state-owned presses and other media outlets to control the flow of information to society. The government tolerates the existence of privately-owned newspapers and can regulate them through the flow of advertising revenue, but it has consistently intimidated those that dare to question and challenge the status quo. This intimidation has taken an extreme form in arson and assassination, but sometimes involves closing down newspapers and detaining reporters, leading to the development of ‘guerrilla journalism’ operating underground and at tremendous personal sacrifice and risk. 16The press, begun in Nigeria in 1859, is the country’s oldest democratic institution, and the continuation of a free press clearly needs to be supported. It was acknowledged, however, that some elements within the media have tended towards sensationalism, exaggeration and at times a complete fabrication of the news, leading to a loss of credibility which helped to further factionalize the Nigerian society. The strong regional bias of many papers also feeds endemic sectional hostilities in Nigeria. Harsh living conditions also make many reporters vulnerable to financial ‘incentives’ or ‘brown envelopes’ offered by the military or prominent civilians. ‘Honest’ reporting was understood to be essential to create responsible dialogue among Nigerians on the issues facing them and the democratization process. 17The overwhelming view expressed about the current three-year transition exercise, outlined by Abacha in October 1995, was that it is fundamentally flawed and unlikely to bring about a democratic transformation to the country, even if it succeeds in bringing about civilian rule. There were many reasons for this skepticism, most notably the misgivings about the military’s intention to disengage from politics, and the inherent contradiction of having the military ‘create’ democracy. The manoeuvering and manipulations of the Babangida transition, in which Abacha played a major role, cast doubt on the sincerity of the military. Consequently, the prevailing political climate is one of suspicion. 18The lack-lustre performance of the National Constitutional Conference (NCC), begun in June 1994, fulfilled the government’s wishes. More than one-quarter of the representatives were government appointees, and the majority seemed wary of antagonizing the military. Serious issues were discussed, but little resolution to them was found.3 When the members were emboldened sufficiently to resolve that the military should leave office by 1 January 1996, they were forced to repeal the decision by the military’s deft use of the carrot and the stick. The potential role of the detained claimant-present, Chief M.K.O. Abiola, was never fully debated. 19The fact that the transition was already behind schedule worried many conference participants: there was no electoral register, and the political parties had not been approved. A prevailing viewpoint was that the criteria for political party registration were impossible to meet in the few weeks allowed by the military. This led to an opinion that such delays and manifestations of instability might be used as the pretext for Abacha to remain in power, either through the prolongation of military rule past the October 1998 deadline, or else through the guise of Abacha standing as a civilian candidate (and winning, of course) in a presidential election. Such ‘guided’ or ‘gun-powered’ democracy is becoming prevalent in West Africa, such as in the Republic of Benin and Niger. 20Another fundamental flaw is the fact that the transition process is not in the least democratic, but rather is being tightly controlled by the military itself. Civilians aspiring to politics are carefully vetted and screened by the military and only those who offer them little or no threat are allowed to take the political stage, and then under a continuing watchful eye. Those who show a measure of independence or links to the pro-democracy movements are excluded. Furthermore, there is no constitution in force to protect people’s rights (that has been put on hold until 1998) and there is no truly independent body that is able to safeguard the democratic process. As was the case under Babangida, there is little chance that the National Electoral Commission of Nigeria (NECON), established in December 1995, can act independently of the military, and NECON is suspected of containing Abacha ‘supporters’ to monitor the process. Similarly, the ability of the judiciary to play a strong, independent role has been minimized by years of overt pressure and the fact that civilian courts have no jurisdiction over actions of the military. 21Those civilian politicians emerging in the current transition exercise do not appear to be devoted to the principle of democracy, but rather to the principle of opportunity. It is not too extravagant a claim to say that a civilian government emerging from this transition will not be a truly democratic government, even if it is created by election, because many of the legitimate democratic forces within the country are being excluded from the process. Aspiring civilian politicians must be willing to bend to the wishes of the military both during the transition and, afterwards, when in government. Perhaps the fear that an Abiola-led SDP government would dig into the military’s affairs was a contributory factor to its preemptive demise, although Abiola was probably about as ‘safe’ as the military could hope for. 22Lessons from the recent trials of former leaders in South Korea will surely have been absorbed by the Nigerian military. But how can civilian leaders assuage the fears of the military that they will not be hounded? What ‘incentives’ should be given to hasten the departure of the military? Do such considerations devalue the transition? Should there be a civilian government ‘at any price’? How can morality and reality coincide in the dialogue between the military and civilians? Will serious divisions within the military derail the transition before 1998? How can civilians keep the military ‘busy’ after the transition, if it is ever successfully completed? 23Besides the important fact that many pro-democracy elements are being forcibly excluded from the transition, fears were expressed that the civilian elite is simply ‘collaborating’ with the military and serving its own narrow interests, operating on the AGIP principle; i.e. dealing with ‘any government in power’. The military’s powers of patronage and cooperation are sufficient to seek out and woo a new group of uninspiring civilian politicians and undermine the democratic process. Possibilities that traditional rulers could play a role in democratization were largely discounted because of their need to navigate the political waters and remain in the favour of the military to retain their status. The fact that many positions of traditional authority are being occupied by former military bosses further weakens the likelihood of a pro-democracy stance from this sector. 24One measure of democracy that is often overlooked is how the losers accept their loss. In Nigeria, it is all too common for losers to accuse others of the rigging or manipulation of the voting systems. Of course, such activities do occur, but there appeared to be little confidence that the current transition was instilling the virtues of democracy into prospective candidates by educating them on how to gracefully accept defeat. 25An overriding issue within the transition process was considered to be the necessity of facing up to the issue of the annulment of June 12 (1993) and the subsequent imprisonment without trial of Chief Abiola. There was, however, little consensus on how exactly to do this. A reinstatement of Abiola was considered highly unlikely and would probably polarize sentiments in the country. Although Abiola gained significant support across Nigeria, the pro-Abiola camp is perceived as a southern, or even Yoruba, movement in the eyes of many traditional northerners who lean more in favour of forgetting Abiola and moving forward to a fresh transition exercise. Perhaps drafting Abiola into some form of civilian or civilian/military transition government would be an acceptable compromise to many Nigerians, though this option still appears unlikely. It remains unclear exactly what role, if any, Abiola still covets and whether the assassination of his activist wife by ‘unknown forces’ in June 1996 has altered his political stance. His continued detention, however, undermines the transition and the ’12 June’ rally-call provides a focus for discontent that itself could threaten the transition exercise – perhaps a strategy that General Abacha is actively pursuing. 26Other features of the Abacha transition programme appear to be fraught with difficulty. The NCC discussed in depth the issue of regional power rotation and zoning but did not come to a firm resolution except that the presidency should be rotated between North and South, going some way to break the northern grip on power. General Abacha in October 1995 decided to support the creation of six administrative regions within the country to share and rotate the six senior government posts. How exactly this will be done has not been explained in detail, as the publication of the new constitution has been delayed, but it is certain to prove contentious. Although explained by the military as assisting democratic governance, it is thought that it will likely lead to violent controversy within the regions, possibly offering a mechanism for the entrenchment of military and/or northern power. 27The adoption after 1998 of the French model of hybrid parliamentary and presidential structures, an idea first raised by senior civil servants in 1990, is considered by many as simply a way to maintain some northern control by having multiple centres of power. There was little hope among participants that this model of government is more likely to be successful than previous systems, largely because respect for democracy has not been promoted in the country. Within this overall context, the likelihood of successful state elections in 1997, followed by national assembly and presidential elections in 1998 seemed inconsequential. 28An overwhelming sentiment of the conference was that the current transition is not a democratic exercise, should not be recognized as such by external observers, and is unlikely to bring about democracy within the country. The creation of ‘true’ democracy, under favourable conditions, is likely to take ten to twenty years, because it requires widespread education on the merits of democracy and a liberal political environment that allows for free expression. Neither element is present at this juncture. 29A critical problem in promoting democracy in Nigeria is that there is little agreement on what democracy actually means.4 Is it limited to freedom for the political parties or extended to freedom of political philosophies? Is it the adoption of western-style liberal democracy or pre-colonial African democracy? For many aspiring politicians, it simply means civilian rule at almost any price and terms. For the elite, democracy in terms of popular empowerment of the masses would severely undermine their ability to ‘extract’ resources from the state. Similarly, business elites favour stability at the expense of democracy, which is perceived as a code-word for chaos. Many religious groups and traditional rulers who favour the establishment also tend to simply equate democracy with civilian rule, rather than wide-ranging political reform and involvement. 30Many other groups, however, are developing within a society that construes democracy in terms of participation, accountability and transparency, and which is struggling to get a ‘better’ government for Nigeria. These pro-democracy groups have mushroomed following the establishment of the Civil Liberties Organization (CLO) in October 1987, ironically in response to the harsh policies of the self-proclaimed pro-human rights government of Ibrahim Babangida. The majority of these groups contend that the creation of a culture of democracy requires an attitudinal change among the country’s élites. Some of these pro-democracy groups are themselves elitist in structure and do not easily make linkages to the wider society. Others emphasize the need to educate ordinary workers and farmers, male and female, about the importance of democracy, thus helping to develop a popular vested interest in democracy that could prevent the manipulation of the political game by the elites. Such a programme at the local level is an essential element in the promotion of sustainable democracy. Expectedly, the shift in orientation will not happen overnight. There is widespread distrust and apathy and this makes it difficult for pro-democracy groups to recruit support. 31There has been a proliferation of pro-democracy groups within and outside Nigeria and it is difficult to keep track of all of them.5 One categorization of these groups was presented as (a) civil rights groups, such as the CLO [8 groups total]; (b) pro-democracy groups [32 groups]; (c) special interest groups, such as WIN and the Movement for the Survival of the Ogoni People (MOSOP) [17 groups]; (d) unions such as the Academic Staff Union of Universities (ASUU) and the Nigeria Labour Congress (NLC) [14 groups]; (e) external groups, such as MOSOP-UK and NADECO-Abroad [15 groups]; and (0 umbrella groups, such as the United Democratic Front of Nigeria (UDFN), the Campaign for Democracy (CD), and the National Democratic Coalition (NADECO) [6 groups]. 32A practical difficulty now appears to be presented by this proliferation and the consideration cross-cutting in the membership of these movements. Of course, on the one hand, this is a positive development in the sense that the more widespread these groups are the better, and the more chance they have of success if they work locally; however, a drawback lies in the lack of coordination and networking among these groups and at times the mutual suspicion and rivalry between them. This is heightened by the fact that the majority of support for these groups emanates from southern Nigeria, and the south-west in particular, and tends to include only northern minorities and not the northern ‘mainstream’. This creates a perceived southern agenda, accentuated by an antagonistic press, against which the northern establishment has closed ranks and reinforced its solidarity. 33How can these groups extend their appeal to generate ‘mass’ support? How can groups inside and outside the country and in the north and south better coordinate their actions? How can the democratic message permeate the emerging new elite group of politicians? These difficulties serve to undermine democratic pressures exerted on the military and make it easier for the Abacha government to resist these movements. Contrasting the Nigerian scenario with apartheid South Africa where a relatively united movement under the African National Congress (ANC) was able to press for change. Nevertheless, these difficulties should not detract from the courageous stance that these organizations are taking at the current time. 34Efforts to awaken the desire for democracy can be exerted at many levels. Professional groups, such as lawyers and doctors, have had tendencies to support such principles beyond individual practitioners who are prominent in the human rights’ movements. Building such support among professional bodies is an important element to promote democracy. Traditionally, outspoken groups such as university lecturers, trade union representatives, and workers need continued support to maintain their high profile struggle for a more just Nigerian society. The union leadership was hijacked by the government after the 1994 strike and NLC activists continue to be harassed. 35Student movements have also suffered significantly at the hands of the military in the struggle for democracy. The severe cutbacks of revenue for the universities combined with the military’s intimidation of the majority on campus have greatly undermined the quality of education given to the nation’s youth, weakening the base of educated and responsible citizens. The already fragile economic condition of the country further exacerbates the situation. The elites, both military and civilian, have often been able to circumvent these problems because they have the resources to send their children overseas for their education, so perpetuating age-long societal inequalities and divisions. 36Although there must be a realistic assessment of the short-term obstacles to democracy as well as the need for patience in the democracy learning curve, immediate steps to bolster democracy are needed. Such steps include those discussed above, as well as maintaining pressure on the military not to abuse the current transition exercise. Such pressure should not only come from within the country but also from outside. Perhaps the most practical current options are to support the transition, to work to end military rule and to create a civilian government willing to contemplate the wider issues of democratic society and governance. 37There was a consensus among conference participants that economic conditions within Nigeria are poor and that the continuation of economic centralization hampers the fostering of democracy. An estimated 40 million Nigerians live below the poverty line of $1 or 85 Naira per day; social indicators such as infant mortality and literacy rates have worsened during the 1990s; and manufacturing is operating at only 30 per cent of capacity. Structural adjustment programmes, while being arguably promising in the long-term, have brought severe hardship to the majority and have effectively decimated the ranks of the Nigerian middle class, leaving a wide gulf between a wealthy elite and the rest of society. Unemployment and underemployment make the task of earning a decent living a very difficult one. The apparent vitality of the informal sector has done little to provide economic security. The population, estimated at approximately 100 million, is growing rapidly and is expected to double by 2025 with 70 per cent in urban areas. The strain on many urban centres is already showing. 38At the official level, the plundering of the economy by successive military (and civilian) administrations appears to have reached new levels and billions of petrodollars remain unaccounted for. There is little confidence that a new civilian government would itself not be drawn down the same path – in fact, the opportunity to exploit is widely considered as a prime motivation for the aspiring political class. Other corrupt practices, such as the narcotics hade and 419 scams (the advance-fee fraud), continue at high levels, both financially and apparently politically, enriching a few and besmirching the majority. 39The current role of foreign multinational companies (MNCs), and the oil companies in particular, in the Nigerian economy provides little hope that they can be used as a catalyst for change. Many MNCs appear to be not just tolerant of Abacha but actually in collusion with him. Comparisons with apartheid South Africa should not be stretched too far, but participants expressed the opinion that Western companies may not want to endanger their long-term interests by their present overfriendly attitude towards the Abacha regime. Many new investors are staying away from Nigeria, and this downturn affects ordinary Nigerians and to a lesser extent, the elites. 6 Francois Misser, European interests in Nigeria. In: Nigeria during the Abacha Years..., 235-257. 40However, the oil and gas sectors present a different picture and it is anticipated that there could be as much as $8 billion invested before the year 2000.6 The demand for Nigerian oil in the US and Europe (the US takes 45 % of production, the EU 35 %) and Nigerian gas in Europe makes it unlikely that the oil companies will want to antagonize the Abacha government. The signing of a $3.6 billion Liquefied Natural Gas (LNG) agreement by Shell, Elf and Agip in December 1995 immediately after limited sanctions were imposed on Nigeria by the Commonwealth and EU is an indicator of the priorities and morals of the oil companies. Such a potential oil and gas bonanza must also tempt the military to remain in power to reap the financial benefits, legitimate and otherwise. 41Sanctions against the Abacha regime were discussed during the conference, but the participants did not think that they would be effective. It was noted that the Nigerian population was evenly divided over the issue of sanctions. Those sanctions that could harm ordinary Nigerians were not welcome by participants, but measures that target the military government were generally supported. Trying to freeze the assets ot government officials was considered only marginally beneficial because it was assumed that most of them had their money beyond reach. Sporting sanctions were regarded as a possibility, extending to individual Nigerians as well as teams. A tighter ban on the sale of weapons to Nigeria was called for, but it was realized that the government would probably be able to purchase weapons from China or on the open market. 42Oil sanctions – the only measures with real bite, as oil accounts for 98 percent of foreign exchange earnings – were judged unlikely to occur and could possibly be counterproductive. Both Britain and France have a lot at stake here and are unwilling to act. Pushing Abacha into a corner might also harden the government’s attitude and could help to rally support for the regime against these ‘anti-Nigerian’ external forces. ‘Why pick on Nigeria, which has a timetable for democratization, and not Saudi Arabia or China?’ might be a question Abacha could raise. 43Another economic issue discussed that underlies the democratization process was that of revenue allocation within the federation. A long-standing issue dating back to pre-independence times – the question of how to distribute revenue within the federation – has again become volatile, exemplified by MOSOP’s claims to the right to retain all revenue from oil exploration locally. The current derivation principle only allows for 10 per cent. The violence with which the military has met these calls indicates the government’s unwillingness to discuss the issue of allocation. But this issue cannot be glossed over and with 30 (now 36) states agitating for increased revenue combined with a delicate transition exercise, the prospects for a derailment of the transition are high. In such a highly-charged atmosphere, balanced dialogue on equity and principle is unlikely. 7 Tim Clarke: An Overview of EU/Nigerian Cooperation. 44How the EU relates to the issue of Nigerian democratization was broadly discussed, and mention was made of the role of other international actors such as the US and the Commonwealth. The limitations of EU action were spelt out both in terms of European unwillingness to destabilize the Abacha government and also through an explanation of the decision-making processes within the EU that left individual national governments with measurable autonomy from and leverage over the EU in external matters. The EU could perhaps facilitate change but certainly could not force it.7 Such ambiguity led to confusion about what the EU really stands for in Africa: if there are strong claims to support human rights, then why do European companies consistently undermine them? Is the EU guilty of empty rhetoric? If the EU oannot act against oppressive regimes such as Abacha’s, where can it act? Does market access override concern for human rights? 45The EU remains a relatively important economic partner for Nigeria. Although exports from EU members are declining, Nigeria is second only to South Africa as a destination for European hade in sub-Saharan Africa. EU members remain the principal destination for Nigerian exports. In terms of aid, Nigeria is the largest recipient of aid within the African, Caribbean and Pacific (ACP) group under the most recent Lome convention, and has received ECU 1 billion under the four conventions. EU aid programmes to Nigeria are second only to the World Bank’s. However, Nigeria is not really an aid-dependent country to the extent that, for example, Kenya is, so withdrawing aid is unlikely to have much impact on the government. 46Nigeria’s national debt continues to climb and currently stands at $37 billion. Two-thirds of this is official debt owed to the Paris Club, of which 60 per cent is owed to EU members. Possibilities of using this debt to leverage Nigerian policy was discussed, but such a stance was acknowledged to have uncertain potential. The 1996 budget only allocated $2 billion towards debt repayment, indicating that the debt will continue to rise. 47The United Nations, the Commonwealth, the US and the EU/ACP Assembly, among others, have all condemned the repressive stance of the Abacha government. The EU has gradually increased its measures following the annulment of Abiola’s election in 1993, continuing with the disappointment of the transition programme announced in October 1995, and the hanging of the nine Ogoni dissidents in highly controversial circumstances in November 1995. Current EU measures includes ECU 220m in frozen aid, which primarily affects 38 university libraries and a training project in telecommunications; visa restrictions on high-ranking members of the military; and a ban on weapon sales, though excluded, are agreements signed before November 1995 and weapons needed for the ECOMOG peacekeeping operation in Liberia. 48Although the situation is being closely monitored in Nigeria, it is unlikely that more serious EU measures will be imposed against the Abacha regime, and it was recognized that current measures are only marginally effective. Neither the Commonwealth nor the US appears likely to impose further sanctions on Nigeria. The US wants Nigeria to remain in the ECOMOG peacekeeping force in Liberia, and so does not want to antagonize Abacha. Furthermore, neither the US nor EU wants to destabilize Nigeria for fear of destabilizing the whole West African region. It was also noted that the close relationship between Nigeria and China made it unlikely that any tougher measures would have much success. China signed a cooperation agreement in April 1996 and received an oil exploration licence in September 1996; it could also easily become a potential weapons supplier. 49Within these modest parameters, a possible EU role was staked out which would provide steady support for the transition and democratization. The possibility that the EU could exert more influence on member states to press for a coordinated and more forceful policy on the Abacha government was proposed, as were sentiments that the EU could temper the role of European companies operating inside Nigeria. This could be done by developing a code of conduct for business with Nigeria -especially for the oil companies – with parallels to the situation in apartheid South Africa. Greater EU emphasis could also be placed on environmental protection and safeguards within Nigeria, which would have an impact on the living conditions of many Nigerians, without an overtly political role. Shell’s actions in Nigeria would not be tolerated if they occurred in Britain or Norway. This might also be the route to educate European citizens on the plight of Nigerians and to develop political action within Europe. 50Assistance for the democratization process itself was considered important, as much in these early stages as during the electoral process. Other viable propositions for EU action include: the promotion of democracy at the grassroots level; integral involvement with the National Electoral Commission of Nigeria; strong reinforcement of the desirability of succeeding with the transition; a close and public monitoring of the Abacha government and its adherence to the transition timetable; the highlighting of government corruption, possibly in coordination with the organization, Transparency International; stronger linkages between the European Parliament and democratic groups in Nigeria; greater support for infrastructure, particularly the universities; training programmes for the military to learn about the merits of democracy; and an expansion of aid programmes through non-governmental organizations and channels. 51The EU can also play an important role in persuading Nigeria’s neighbours to be less supportive of the Abacha administration, and at least restrain those countries from sending dissident Nigerians home. Some effort should be made to counterbalance Nigerian Naira-diplomacy within the region and the ACP. Concerted action with the Commonwealth and the US, within realistic limitations, could also help to sway the military towards staying on the path of recivilianization. Some advance planning for what the EU would do if Abacha reneged on his transition programme should be done and made known to the administration. In this context, the threat of oil sanctions should always remain in play to solicit action from Abacha. But such pressure should probably be balanced with strong positive reinforcement and encouragement for the military to push through the transition. 52With the recognition that pressure from inside Nigeria is to be the key factor in bringing about democratization, the EU should identify and support pro-democracy groups who are struggling to promote their rights and freedom. The EU should not waver from such support in order to provide the clearest possible message to the Abacha administration that its current style of government is not acceptable to the international community. 1 Chidi A. Odinkalu, The management of transition to civil rule by the military in Nigeria. In: Nigeria during the Abacha Years (1993-1998). Daniel C. Bach, ‘Kunle Amuwo and Yann Lebeau, eds. (Ibadan: IFRA, 2001): 57-99. 2 Michèle Maringues, The Nigerian press: Current state, travails and prospects. 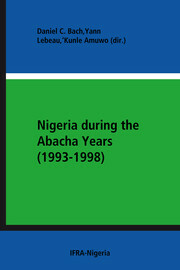 In: Nigeria during the Abacha Years..., 185-218. 4 Attahiru M. Jega, Democracy in Nigeria: Concepts, representations and expectations. In: Nigeria during the Abacha Years 101-144. 5 Abdul Raufu Mustapha, Civil rights and pro-democracy groups in and outside Nigeria In: Nigeria during the Abacha Years145-183. WRIGHT, Stephen. Conference Report. The Nigerian Democratization Process and the European Union In : Nigeria during the Abacha Years (1993-1998) : The Domestic and International Politics of Democratization [en ligne]. Ibadan : IFRA-Nigeria, 2001 (généré le 19 avril 2019). Disponible sur Internet : <http://books.openedition.org/ifra/651>. ISBN : 9791092312089. DOI : 10.4000/books.ifra.651. Wright, Stephen. “Conference Report. The Nigerian Democratization Process and the European Union”. Amuwo, ‘Kunle, et al.. Nigeria during the Abacha Years (1993-1998) : The Domestic and International Politics of Democratization. Ibadan : IFRA-Nigeria, 2001. (pp. 319-339) Web. <http://books.openedition.org/ifra/651>.